The Concordia Stingers did not make things easy for themselves in their thrilling 5-4 victory over the Ottawa Gee-Gees Friday night at Ed Meagher Arena. The team mounted a furious comeback after falling behind 4-2 midway through the third, scoring twice in a 3:12 span to tie the game at four and force overtime. Chu credits her players with being mentally engaged through such adversity, a criteria missing from the team’s psyche last season. “Last season, there were moments where we were up 2-0 and we almost had the feeling that maybe we were going to lose the lead,” said Chu. The Gee Gees broke a 2-2 tie 6:28 into the third period when Laurence Morissette connected on a backhand shot that went over Stingers netminder Katherine Purchase. 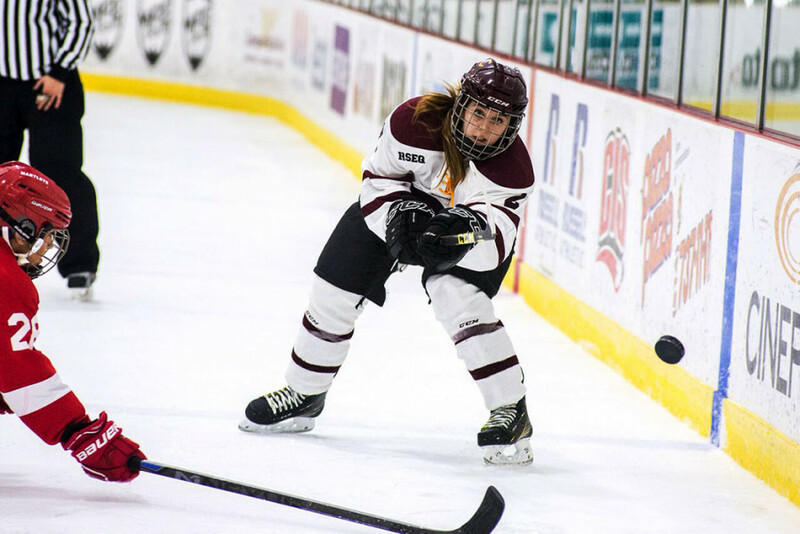 They added another only 1:30 later as Roxanne Rioux dangled her way through a Concordia defender before wristing a shot past Purchase from just inside the blue line. It was her second goal of the night. The Stingers responded with two quick goals of their own. Stephanie Lalancette scored to cut the deficit to 4-3 at the 14:27 mark of the third period. They completed the comeback thanks to a point shot through traffic on the power play from defender Caroll-Ann Gagne. “Our girls have spent a lot of time focusing on the mental game and focusing on the idea that they need to develop as a whole athlete. I am very proud of our girls,” said Chu. Claudia Dubois led the way offensively for Concordia. She scored a power-play goal late in the second period and picked up a primary assist on the game-tying goal by Gagne. Dubois would also score the lone goal in the shootout when her shot hit the crossbar before ultimately finding its way into the back of the net. Dubois admits the goal was a “bit lucky” but said she was deserving of the lucky bounce after she hit the goalpost in the overtime frame. Despite the offensive nature of the contest, much praise was directed Purchase’s way. The Stingers goaltender made 19 saves throughout the game—none bigger than those made in overtime when her team was down a player thanks to an inopportune bodychecking infraction. Purchase also stopped all five shooters she faced in the shootout to preserve her team’s win. The game was played in front of a raucous crowd of 210 spectators. Many of those in attendance were Stingers alumni, who were on hand for a special event held before the game. Both players and coaches could feel the energy from the particularly partisan crowd. The Stingers will host the Université de Montréal Carabins on Sunday at 3 p.m. back at Ed Meagher Arena.